Around here, we’re getting the last of April showers and the earliest of migrants. Everywhere else, other things are happening. But no matter where you are, you undoubtedly have good reasons to get out and enjoy nature right now. But did you? Every year, I look forward to the arrival, brief as it is, of White-crowned Sparrows to my feeders; this weekend, a gorgeous pair dropped in for breakfast. Corey really enjoyed spring migration this weekend as he birded across Queens on both Saturday and Sunday morning. 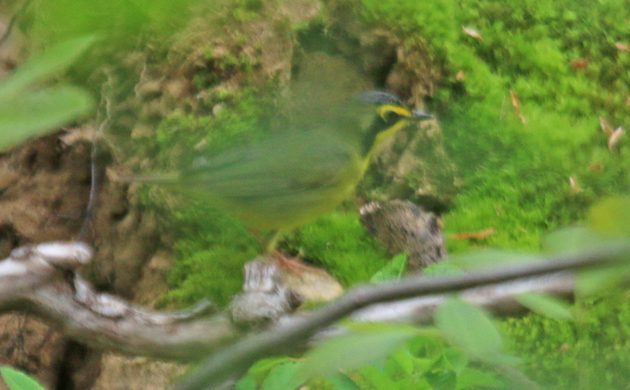 Among the many first-of-the-year birds he saw his Best Bird of the Weekend was a Kentucky Warbler that he really had to work for in Alley Pond Park. Birding Brigantine with the Queens County Bird Club at the end of a long day of birding in southern New Jersey, we were treated to a number of Clapper Rails clacking, bathing and running away from our cameras. Finally, we all got into our cars and were about to proceed down the Wildlife Drive when a very different call, loud grunts. In unison, we all got our of our cars, looked at each other, and looked in the direction of the grunts. It took a few seconds to wrap our minds around the fact that we were being bid a very loud farewell by a Virginia Rail! The best bird was the Least Bittern in Central Park, but the best looks were at a super-confiding Ovenbird nearby. The Swifts are back over Heidelberg/Germany! Owens Lake Bird Festival in Lone Pine, California was tremendous! So many shorebirds and ducks, as well as migrating songbirds, it is hard to pick a favorite. The long-billed curlews and whimbrels feeding on the mudflats, as a peregrine falcon swooped nearby, were a definite highlight.